Maps and Location based apps are by far the most helpful and effective smart phone tools. Unfortunately, their success is mostly in an outdoor setting where GPS signals work well. They do not work well in an “indoor setting” e.g. inside a shopping mall, museum, hotel or a casino. Aggravating the problem of weak or unavailable signal is the indoor specific location information – the Spa inside a hotel, or the Restaurant or the roulette table in the casino. Indoor navigation isn’t really a technology; it’s an idea! It goes something like this: what if there were apps that worked like GPS, but indoors? What if we could take positioning technology and mash it together with maps of shopping malls, hotels and casinos – or any other big, confusing, indoor space? This picture should clarify the idea. Finally, the dream seems to be within reach! Apple’s new iBeacons for iOS 7 implements a Bluetooth Low Energy (BLE) profile for micro-location, which opens up whole new possibilities for hotels and resorts using very interesting geo-fencing. Instead of using GPS satellite signals to locate a device, using BLE one can enable a mobile user to navigate and interact with specific regions geo-fenced by low cost signal emitters. These emitters can be placed anywhere, including indoors and on moving targets. Also, iOS devices themselves can also act as an iBeacon. An user armed with an iOS 7 device, acting as an iBeacon, can trigger events around them. This may allow them to do several interesting actions: for example, turn on or off lights, unlock and open doors simply by signaling the user’s proximity to devices listening for it via BLE or even receive a special offer from an indoor attraction! BLE specification also supports peripheral push notifications, which Apple would support in iOS 7, enabling developers to have applications send data to connected Bluetooth devices without needing to have the application open and running. iBeacons can be used to build an interactive tour of a hotel or a resort, where the user’s attention is directed to specific exhibits as they walk freely within the building. 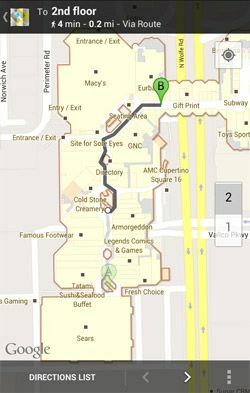 This feature would to enable indoor navigation similar to GPS in settings where GPS signals aren’t available. If this sounds all very confusing this picture would certainly help. This would provide virtual maps and turn-by-turn directions to the favorite destinations inside the premises of a hotel or a casino. Another application may be to present hotel guest with a “broadcast of location specific offers“. This particular application would make iBeacons an extension of the geo-fencing Apple enabled in Passbook, which lets a pass, ticket or loyalty card popup on the phone screen when the guest cross the geo-fence threshold of a defined iBeacon location. Using BLE, the hotel property owner can define more targeted “micro-locations“ to trigger an alert, an offer to a Hotel Spa or a special discount for a beverage at the bar. If Passbook is combined with iBeacons, hoteliers would be able to customize promotions to specific locations in their properties and send them right to a users iPhone via Pass for Passbook. Rather than just getting blasted with coupons when a guest walks in to a hotel, he would only receive coupons and offers when approaching specific areas of a hotel where he would have interest. Consumers would have the choice of categories or only the right offers presented to them via Machine Learning/Artificial Intelligence. Please note that casinos and hotels are already starting to provide similar services within premises. However, iBeacons & Passbook offer a much more dynamic and real time configurable service. iBeacons will be unveiled in thefall of 2013 with iOS7 thus enabling the iPhone a lot more useful as indoor navigation tool inside hotels and resorts. Location based mobile marketing can yield sky-high conversion rates with surgical targeting of ads by providing the right offer at the right place at the right time!